The black Chuck Taylor All Star is still cool after seven decades. To kids, sneakers are way cool. Not just high-tech, high-priced sports shoes, but genuine canvas-and rubber sneakers. Kid at high schools, college campuses and rock concerts are just as likely to be wearing high-top, low-tech sneakers as Reeboks or Nikes. After all these years, sneakers are still at the top. 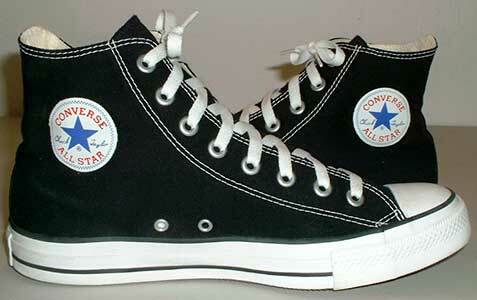 The Converse All Star, the quintessential canvas-and rubber sneaker, was introduced in 1917. There have been modifications over the years, but the original design was so good, it appears to be timeless. The All Star’s role as a premier sports shoe, primarily for basketball, dates to 1921. This is the year an athlete named Charles “Chuck” H. Taylor joined the Converse sales force and traveled throughout the country spreading the sneaker gospel. Taylor was a star basketball player in the barnstorming pro leagues, which were popular 25 years before the formation of the NBA (National Basketball Association). Through his own dedication, Taylor became much more than a traveling salesman. He hosted clinics and promoted basketball, which was invented by Dr. James Naismith in the late 1800s, in its fledgling years. Taylor’s tireless efforts were rewarded with the nickname “Ambassador to Basketball”. His input at Converse also led to important changes in the original shoe, and, in 1923, [actually 1932, ed.] his name was added to the ankle patch. Since that time, to aficionados, the most influential sports shoe of all time has become known as the Chuck Taylor All Star. Taylor, who died in 1969, would be pleased to know that the sneaker that bears his name still sells at the rate of approximately 30,000 pairs a week. To date, Converse, based in North Reading, Massachusetts, has sold more than 550 million pairs overall. A concession the All Star has made to modern times is a newfound emphasis on style and fashion. Today, since it is considered primarily a street shoe, the All Star comes in more than 50 colors, including traditional black and white, plus navy, red, denim, maroon, ice blue, purple, terra cotta, and something called raz. A new generation of highly specialized leather footwear, starting in the late 1960s, finally surpassed the Chuck Taylor All Star as a performance sneaker. The torch has been passed to competition shoes with new designs and technologies. Today, Converse Chuck Taylor All Stars are more likely to be seen on MTV than in the NBA, but the fact that they’re still popular demonstrates the enduring appeal of the original, classic design. This article was in the June, 1991 issue.